This is Reggie. He is a bird. He is very sensitive about it. The premiere episode of The Fourth Wall, “Clipped Wings,” will run on Wednesday, September 27th. Therefore, over the next several weeks here on the blog we’ll run brief introductions to the characters for the show. Two weeks ago, we discussed the series’ lead, Abigail Westing. Read all about her here. Last week, we caught up with the aging sidekick to Sherlock Holmes, John Watson, MD. Read all about him, here. This week, I must offer an apology to the memory of Edgar Allan Poe. While his poem, “The Raven,” is a classic, he got it all wrong. The bird that haunts poor Lenore’s widower never meant to scare anybody. He was just seeing if he could borrow a cup of Nevermore Brand Absinthe. His name is Reggie, if you please, and that “poem”* is one of the great miscarriages of literary justice. He’s tried to move on from that fateful midnight dreary, but only more indignity awaited him when he started his new life at The Fourth Wall. When he arrived at The Wall, he thought he’d find a life of adventure and wonder. Instead, he has to work in the mail room. Where else would a bird find gainful employment in the world? Having spent the last 170 years making sure inter-office memos reach their intended recipient, he’s developed a caustic sense of humor and a deep skepticism about the stoicism displayed by Director John Watson, MD and his Fourth Wall agents. And yet, his bravery can not be denied. Having singled-wingedly—and at great personal cost—repelled a recent attempted invasion from the vampire Dracula, Director Watson has little choice but to give Reggie an opportunity to prove his mettle among the agents of The Fourth Wall. He agrees readily, although he may yet live to regret the decision. Now, the hours are terrible, the work is hard, and he’s in mortal danger nearly every week. Some may think he’s not up to the job, but few can deny that he is the very heart and soul of The Fourth Wall. Reggie is voiced by Mac Bayle. I’m sorry, that should read Boyle… as he is, um… Me. Why would I have decided to play one of the main characters, in addition to co-creating, writing, directing, editing, and overseeing all of the tie-in material for The Fourth Wall? Because I’m a deeply broken person, that’s why. Really, folks: Seeing all those posts written out like that makes even me question my sanity. But seriously really, of the few acting roles I’ve taken a stab at, Reggie is the closest to my own personality. Not only that, but of all the characters I’ve written, he is the closest to me, feathers and beak notwithstanding. Sorry, Orson. I’d write more about Reggie in this space, but guys… I’ve got to finish the actual radio show that all of this is leading to. Currently we have two episodes in the can. That’s some runway for when the show starts running on 9/27. But I gotta get more. I just gotta. Can’t stop. Can’t ever stop. Next week, we’ll wrap up our pieces on the characters of The Fourth Wall with a warning. Dracula is already all around you. He’ll strike when you least expect it. In the mean time, find where to subscribe to The Fourth Wall podcast here. *Reggie made me put that in quotes. He’s very particular on that matter, even if I think “The Raven”—at the very least—does not need quotation marks around it. That is, unless we’re talking about the title. Punctuation is super hard folks. That’s why I’m working in audio now. 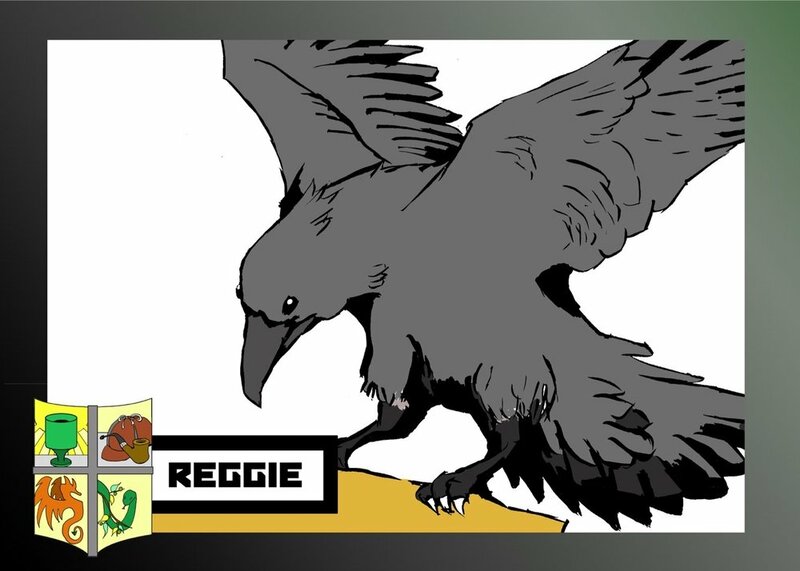 Also, it should bear mentioning that Reggie The Raven™ is not—to my knowledge—real. I think. Ahem.